It's Easter, which means it's chocolate time. My idea is a chicken made out of brown and white chocolate sitting on chocolate eggs (which will be added in time; I'll work on the chicken first), and I decided to start out with cluster stuff that I'll clean up later on and stuff. The nest is probably going to be a problem, though; after all, a bird nest is made of hay and whatnot and its texture won't be easy to make, so for now I just made a white cluster area and scribbled lines all over it to try to maintain that feel. I think I might try a different approach; maybe shape it and shade it like a donut/3D ring and then make it look like a nest. 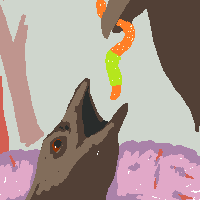 I did try looking at pictures of bird nests, and I don't know if there's any pixel art featuring bird nests that I can look at. 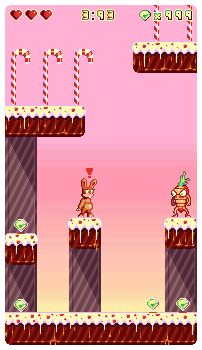 Reusing my chocolate palette and choco tile concept, this time it has chocolate eggs cause I decided to be a boring person. Well this is my first time posting despite visiting regularly and having an account for multiple years, now's a good a time as any. I'm going to name it Choco-bo. @Kedume, We have no problems with meta pixels and this type of art. However, when the basis for any of this type is based on the pixel placement of another's work then we cannot add to the gallery, k. If based on your own pixels then its totally cool. The cursor you have here is by Susan Kare so even tho you did make it and its pixelart it would still be considered a RIP. I think I'll do an over the top thing this time. St George slaying the chocolate dragon. Here's a bit of concept art. @Mrmo - not sure if it's my monitor, but the low contrast on a bunch of those tiles make them seem very blurry. And not just the fadded purple-y ones, but also (mostly) everything in the first pic besides the largest egg. Thanks for your time jalonso. Looks really cool though, getting Rayman 1 vibes, it has a candy world with a cream-on-chocolate theme too. @Mrmo: The sandwich ice cream made me giggle with glee! Now, normally, I'm a big fan of your dull reds, but perhaps the cherries need to be a bit more shiny and saturated? @neo: Looks very promising, will comment when it's pixel form. @feiss: Doesn't look like pee at all, I think. (sh*t, I forgot to censor the e's) But I'm not quite sure what I'm looking at. At first I thought it was a chocolate mummy, with bandages made from wrapping paper. But now I'm thinking it might just be a chocolate ooze monster. @Tarius: ice cream sandwich is absolutely delightful! I like the new clouds. Pixel form, but under heavy re-tooling, because I messed up the anatomy (typical). Getting a toothache just looking at it! Nothing crazy or anything like that, just going for a rather simple mockup since it's been ages since I last posted a pixel on here. Perhaps it needs a bit more chocolate to fit the Easter theme. You really never fail to impress viewers, that is reallllly awesome! Haha, that's a great idea! I really hope you finish it! Even though it's only two colours it's already extremely readable! keeping the spear antialiased is a challenge. Unfortunately I only have until tonight to work on it, because this weekend it's Ludum Dare and I'm taking part. So any crit, ideas or help you care to give in the next 10 hours or so, is really appreciated. @ADrawingMan: Looks nice. Maybe you could do something interesting with the surface of the tablet, to make it really shiny and glossy. The gems don't looks quite right to me. They look a bit... hollow, from the way they're shaded. @neofotistou: I'm a bit curious about the composition, because it looks a bit cramped. Is that some kind of 18th or 19th century style? The cape (which looks a bit short) nearly touches the left border, the chocolate dragon barely touches the right border, etc. From the way the knight's holding the spear, it looks like he's striking straight down, not so much towards the viewer. But the dragon looks to be closer to us, not really below him. Maybe reducing contrast and increasing brightness on the head and upper neck on the dragon will help give the illusion that the head is much further away (i.e. under the knight) than the dragon's body seen in the lower left. The jaw on the horse also looks a bit short, like the lower teeth wouldn't hit the upper teeth if it closed its mouth. @ADrawingMan. I like it overall but I don't read chocolate on anything. I have it down to 22 colors so I can finally add 3 more accents. But I think my palette is a little dead. Any suggestions? 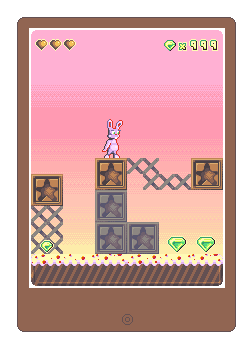 OK, Ludum Dare is starting so I need to call it finished for now. If anyone sees glaring mistakes, I'll try to fix them until Sunday. I think it turned out ok so far. Thanks for the helpful crits guys! I was kind of busy a lot of yesterday and today but I did manage to work a bit on it. I'm putting the chocolate tablet on hold for now and focusing on the tiles. I did try touching up the gems though, I think I might've gotten rid of that hollow feel. 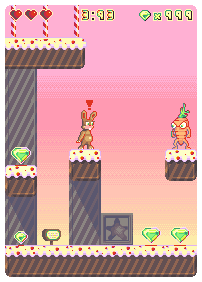 I keep on trying to make the tiles more chocolatey but for the life of me I can't figure out how (obviously that's no excuse to stop trying, just having some problems on figuring out how to make em look right)! @ADrawingMan, Its looking real nice but its not just you. Noone yet has hit the 'chocolate' range yet. Chocolate it best illustrated if your brown palette leans heavy to red. That cake really helped a lot! The tiles don't look 100% chocolate (they kind of look like honey and also a bit flat) so I'm still going to work on them a bit more. I do think that the colours are getting better though (similar to the cake). 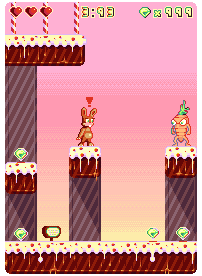 I will try to add bigger globs of chocolate running down the side in my second version coming up. The good thing is that my palette isn't as big as I thought it would be. EDIT: Oh yeah, and I was thinking that maybe my original tiles look better than the newer versions if they use the new palette. I also took out the big gems, they looked out of place. That's great to hear! That cake really helped a ton. I think I'm calling it down though, I won't be able to work on it any more tonight due to sleep. Thanks a million for the help :D (I may even edit it some more if I wake up super early and the challenge hasn't ended yet, unlikely but there is a small chance).